Located in the busy town of Kathmandu Teku, Lavish Interiors and Design Studio have been helping people to turn a house into a home for a year. On the ownership of SmrityRegmi, Lavish Interiors showcases wonderful home décor appliances. She says "Interior style depends on the vision of a person." The interior studio is recently showcasing Residential products. But apart from Residential designing, Lavish also designs commercial and public areas such as banks, hotels and so on. With regards to residential products, Lavish provide interior designing appliances for every part of a house like ceiling, living room and bedroom. Besides, they are best known for the kitchen décor products as they feature one the prominent brand from India called ArnaciaKuchen. Anyone who is building and setting a new home or renovating their place is served by Lavish. Regmi with all her efforts to create a heaven inside her customers' home expressed her endeavor to be very progressive. Regmias a director of Lavish Interiors and Design Studio also shared number of easy interior designing tips for a soothing home environment. While building a house everyone wish for a bigger space to add wider range of furniture and décor items. But if you already have a small and compact room, Regmi suggests painting soft and light colors to make your room feel larger. Further for more enhancements, choose the right curtain length according to the window area. Also never compromise to give your feet a relaxing feel while walking around your home with rugs that softens your hardwood floors. Inviting nature indoor can also add warm vibes to your interior. No matter what it is pick that one item that adds more charm to your room. Choose what you love and what supports a good and quality time in your home. 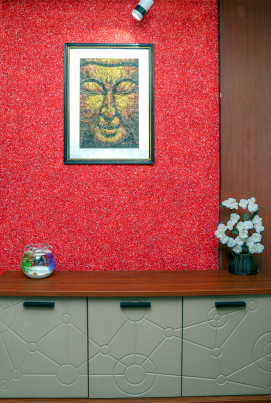 Lavish Interiors will be by your side through your journey to make a beautiful home. "Never Sacrifice Comfort"